Following a cross country search of the oldest functioning Manitou machine in Oceania earlier this year, Manitou Australia has finally located the oldest working machine in the region – a MB 20C forklift. Victoria based materials handling company and Manitou dealer NTP Forklifts’ Sales Account Manager Bob Vermeeren found the machine and took home $2,500 cash for his discovery. The MB 20C, which was still working when unearthed, was manufactured in 1974 and imported in Australia in 1976. At the time, the unit was purchased by Trotta Bros Building Co in Kapunda, South Australia. Manitou Australia organised the competition in July this year to "celebrate the past and look forward to the future." The competition involved all dealers in Oceania but Manitou says most of them are based in Australia as most of the first imports were shipped to Australia. Manitou adds the discovery underlines the fine quality and advanced engineering Manitou put into each and every one of its machines. 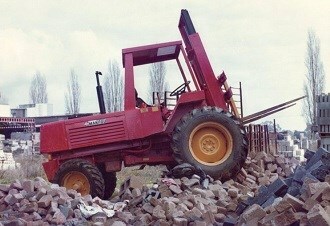 Click here to find Manitou machinery for sale. Click here to look up Manitou machinery specifications.